When I was about 6 or 7 years old, I told my dad that pork chops were my favorite meat. I actually meant spare ribs but got the names confused. After that he would make me pork chops on the grill and happily inform me that he was making my favorite dinner. I dont know why but I could never bring myself to tell him I had made a mistake. Thank goodness Im a grown-up now and can have ribs whenever I please because I still love them. Unfortunately, I avoided preparing them on my own for years in part because I was put off by the saturated fat content. I should have been listening to my inner cave-child. Now I eat them with wild abandon. In addition to spare ribs, I also like barbeque sauce. Who doesnt But I cant quite imagine barbeque sauce without sugar. So I set out to create another flavorful but healthier condiment for my ribs. The first time around I created some kind of mango-rum concoction which was okay, but needed work. This time, I used Indian flavors and was very happy with the final product. These ribs were sweet, tangy, spicy, and falling off the bone. I highly recommend them. My dad died several years ago but his birthday was this week. Happy birthday, dad. You probably would not have liked them much, with the Indian spices and all, but these ribs are for you! Remove silver skin from the ribs. This is a thin membrane along the underside of the rack. It can be a little tricky, but once you get a good grip on it you can peel it off in one or two pieces. Combine rub ingredients in a bowl and use your hands to rub the spices into all sides of ribs. Wrap ribs securely in a foil packet and either heat in your oven at 300 degrees or over indirect, low heat on your grill at for about 1 hours. Meanwhile, you can make the sauce. Heat the coconut oil in a sauce pan and add the shallots. Cook over medium-high heat for several minutes until they soften. Reduce the heat and add the curry powder, pepper, ginger, and garlic. Sautee for a minute or so to release the flavors, but be careful not to burn the garlic. Add the mango chunks and continue to heat until the mango softens and you can mush it easily with the back of your cooking utensil, about 15 minutes. At this point you can just mash everything together by hand or put it all in the food processor to create a smoother sauce, which is what I did. When the ribs are done cooking, remove the foil and feel free to eat them as they are, with the sauce. I placed them on the grill over direct heat for several minutes and brushed on some of the sauce, like a traditional barbeque sauce. Dont put on too much, though, or it will make a mess of your grill. Sprinkle ribs with fresh cilantro and serve with remaining sauce. 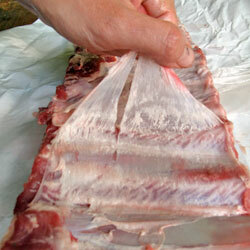 Remove the thin membrane that lines the underside of the ribs before cooking. This increases surface area for the rub and also makes the ribs easier to cut. If you're cooking them on the grill, either use the upper rack as I did here or put them on the opposite side of the grill from the flame. Close the lid and try to maintain an internal grill temp of about 300-350 degrees. This post is participating in Fight Back Fridays at Food Renegade. I’m a big fan of your posts and wish you’d post more often! Beautiful post! Looks and sounds delish! YUM! 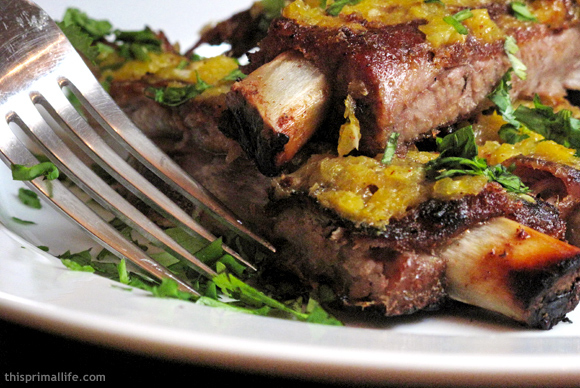 We love spareribs, and I’m going to try these. Currently, our favorite way to eat them is cut up, seasoned with salt and pepper, dredged in organic flour, and browned in coconut oil. Then I fill a baking dish with saurkraut, and place the ribs on top. 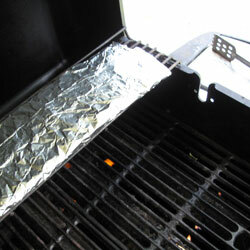 Cover with foil, and bake at 350 degrees for about an hour. Remove foil, and continue baking for about 20 more minutes. They are soooo good! It is my husband’s favorite meal. What a beautiful blog and recipe, I adore mango, thank you for sharing it. So sorry to hear about your dad, but I bet he is smiling. Was referred here by my friend Food Renegade, I’ll be back! These look very tasty – love the mango sauce. I wanted to stop back and tell you that I made these a few days ago, and they are SO GOOD! We used the sauce for dipping, and liked the ribs with and without it. Excellent recipe. My mangos were huge, and I have a lot of the sauce left over. Any suggestions for how to use it up?